If you're running your own crowdfunding campaign then you know just how important, and challenging, it is to find an audience, promote your product and drive action. To help you get the most out of your crowdfunding campaign we've put together this comprehensive guide on how you can use our powerful suite of apps to launch and promote your Kickstarter, Indidegogo, or independent crowfdunding campaign. If you haven't launched your project yet you should also check out our guide on pre-launching, or if you've already completed a successful crowdfunding campaign then take a look at our guide to gaining early traction. When you're launching a crowdfunding campaign, there's arguably nothing more important than building awareness. The more eyes you get on your project, the more interest you will generate and the more funding you will ultimately drive. It's that simple. In order to draw attention to your project you will need to get users to actively share, discuss and socially engage with your campaign. One of the most effective and cost-efficient ways you can do this is by running a giveaway with Gleam's Competitions app. If you run your giveaway with Gleam then we'll facilitate every aspect of your campaign for you, including API integrations with social networks and tracking social referrals. We do the heavy lifting so you can focus on what's important - your campaign. When you run a contest or giveaway with Gleam you're able to incentivise an array of powerful actions. Deciding on what entry actions you want to drive in order to promote and grow your crowdfunding campaign is one of the most important decisions you will have to make. So to help you set your campaign up for success we're going to take you through some of the best options you have to choose from. 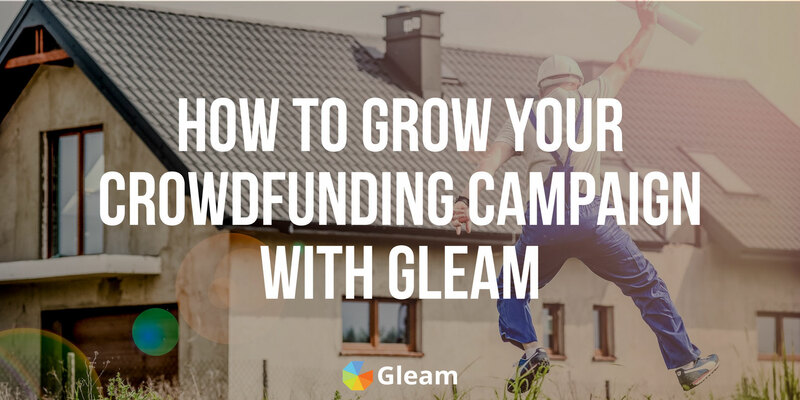 If you're using Kickstarter to host your crowdfunding campaign then using Gleam's Kickstarter action as an entry method is the perfect way to draw attention and drive traffic to your project. If you are hosting your crowdfunding campaign on Indiegogo then using the Indiegogo action is great for driving online traffic to your campaign and generating awareness. For someone running a crowdfunding campaign, email marketing is one of the most powerful promotional tools you have at your disposal. Sending your subscribers updates on your product or campaign as well as targeted calls to action are outstanding ways to keep people interested and drive financial backing, but the effectiveness of this strategy is heavily reliant on the size of your mailing list. To maximise the efficiency of your email marketing strategy you need a sizeable mailing list, and one of the best ways to get one is by using a giveaway to incentivise email subscriptions. Maintaining an active and engaging presence on social media is another outstanding way to captivate your audience, promote your product and ultimately encourage people to back your project or make a purchase once you've launched. However, in order to really make the most of social media marketing you will need to accrue an online following. Gleam has a host of actions across across Facebook, Twitter, Instagram, Pinterest and more which are fantastic for garnering online attention and bolstering your following. Or follow you on Twitter. In addition to encouraging users to visit and follow your social channels, you can also use Competitions to incentivise the spread of your social messages via Twitter. Or send out a Tweet of their own which promotes your crowdfunding campaign, or even your giveaway itself. Both of these actions are terrific ways to gain exposure from a new audience and promote your offering in an authentic manner which people are highly likely to take notice of. If you can increase the number of people who enter your contest you will increase the number of actions you drive and the number of potential backers you reach. So it should go without saying that the more entrants you attract the better. A terrific way to expose your competition to hordes of new entrants is by using Gleam Competition's Viral Share feature which generates unique sharing links and awards additional entries for users who successfully refer the campaign to their friends. This action is incredibly powerful. It can help you create a viral loop effect and gain massive amounts of exposure. This is particularly useful for pre-launch or newly launched crowdfunding campaigns that are trying to generate as much awareness as they can. Viral Share links can be shared across, email, SMS, Twitter, Facebook Messenger, Facebook and more, and users can earn additional entries for each successful referral across any platform. If you're running a crowdfunding campaign you need to showcase the value of your product and build audience trust. A great way to do this is by collecting and displaying authentic and relatable user-generated content which you can collect by running a photo contest. You can use Gleam to run a contest which awards entries to backers who submit hashtag restricted images of themselves enjoying your product with our Select actions for Facebook, Twitter and Instagram, or you can use the Media Submit action to gather images from any of these sources with one easy action. If you want the collection of User-Generated Content to be the backbone of your entire campaign you can restrict entry actions to media submissions and select a winner based on creative merit. There are a lot of incredibly powerful actions you can drive by running a contest or giveaway, and if you want to make the most of your campaign you should be trying to drive as many of them as possible. With Gleam's Bonus action you can award any number of extra entries to users who complete every action in your Competition. This is an outstanding way to encourage a higher level of user-involvement and really make the most of your campaign. When you run a giveaway another important decision you'll need to make is what you want to give away as your prize. Your prize is what will ultimately motivate users and encourage entry, so it's important that you get it right. Your prize should be valuable enough to incentivise entry while still being highly targetted towards your target audience so you're only attracting attention and entries from people who are likely to have an interest in your project. If you're running a crowdfunding campaign then there's no better prize than your own product. The best way to ensure that your contest entrants have a genuine interest in your project is by actually giving away some of your product. Promotion is a critical component of any giveaway campaign. If people don't know about your campaign, they won't enter it. It's as simple as that. If you want your contest or giveaway to reach your target audience and drive real action then you need to make sure that you're using the right promotional channels and tactics. Spread the word about your giveaway across all of your social media channels including Facebook, Twitter and Instagram. If you haven't accrued much of an online following it's a good idea to promote your campaign from your personal accounts. If you have the budget for it, paid ads like Facebook Ads, Twitter Ads, Instagram Ads and Google Adwords are all excelent advertising channels for reaching and connecting with your target audience. Email marketing is incredibly powerful, so don't forget to announce and promote your campaign to your email subscribers. Remember to provide a link to your contest or giveaway from your crowdfunding page. This is a great way to increase participation and engage potential backers who have already shown an interest in your project. A particularly powerful type of giveaway you can run to get your crowdfunding campaign off to a fast start is a pre-launch campaign. A pre-launch giveaway is essentially a giveaway you run in the lead up to the launch of your crowdfunding campaign. It should aim to spread awareness, build hype, and grow your audience so once you do launch, you're launching to a crowd. If you run this type of contest it's advisable that you focus your actions on growing your audience and raising social awareness. Take a look at this demo campaign we've put together to see what your own pre-launch campaign could look like. Another incredibly powerful type of contest or giveaway you can run to promote your crowdfunding campaign is a partner campaign. This essentially involves partnering up with other brands who produce complementary products and hosting a joint campaign where you give away a prize pool made up of all of your products. You will be able to grow your prize pool at no extra cost to yourself. This is a great way to increase your giveaway's value and make entry more enticing. You will significantly extend your promotional reach and gain exposure to the audience of every brand you partner with. If you partner up with related brands who offer complementary products to your own you will be able to reach a highly relevant audience of potential backers and customers. One of our customers, Greenbelly, partnered with 8 other brands to drive 4.1k+ new email subscribers for just $75 worth of prizes. Another customer, Flyte Socks, also achieved outstanding results with a partner campaign. By partnering up with three other brands they were able to drive over 40k+ actions including 20k pre-launch Kickstarter email signups. Want To Run Your Own Giveaway? Check out our documentation on setting up your own Competitions or just get started right now! As you prepare to launch and run your crowdfunding campaign, there aren't many assets you can acquire that will be more valuable than a mailing list. Sending out emails to your subscribers is one of the best ways to make announcements, promote your campaign and drive action, so finding ways to sign-up email subscribers should be at the top of your to-do list. 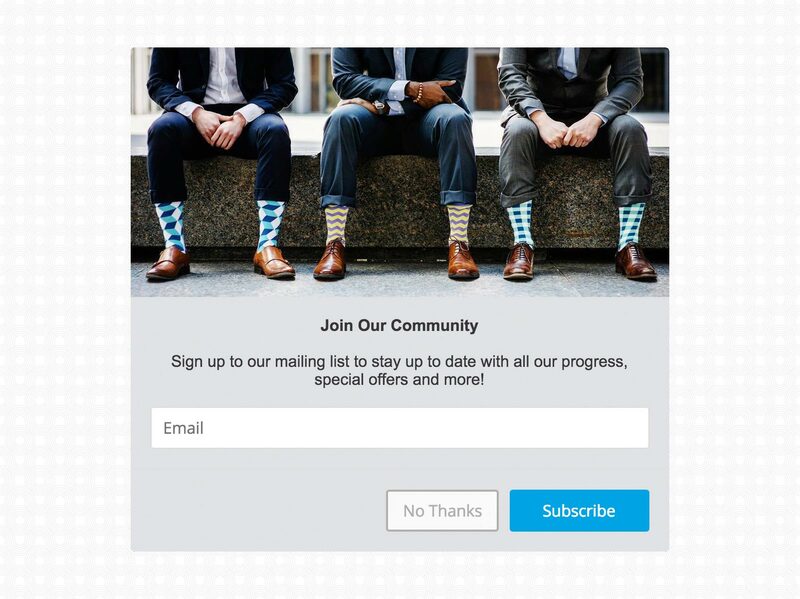 With Gleam's Capture app you can create customized and targetted popups and opt-in forms which will help you grow your mailing list and promote your campaign. If you've got a website dedicated to your crowdfunding campaign then you should be using it to collect email addresses. With Capture you can create custom popups and opt-in forms that will present themselves to visitors whenever (and however) you choose. You may want to present your audience with a bold popup when they check out a particular page or visit your site for a given amount of time. Or you may prefer to use an unobtrusive floating Capture to collect email addresses from anyone who is interested. Building a mailing list can be particularly effective if you're still in the pre-launch phase and you're looking to generate buzz and grow your audience as much as you can. If you want to give your website visitors a little extra incentive to sign up to your mailing list then you may want to use a Coupon Capture to reward anyone who subscribes. 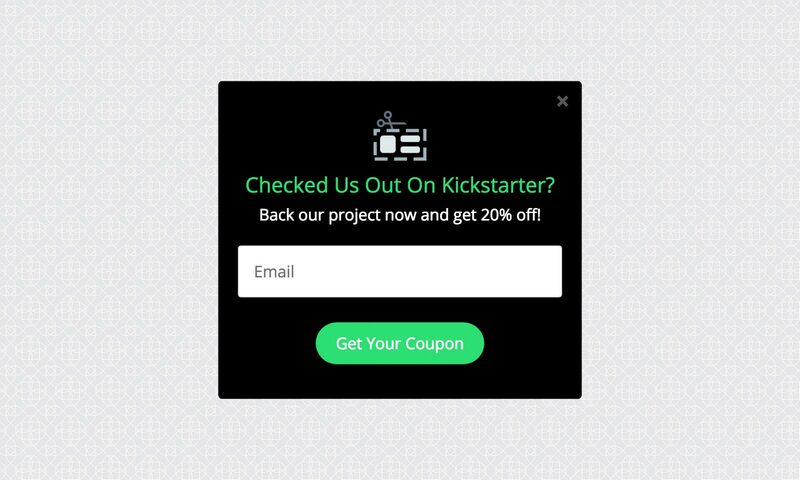 You can use these popups to provide users who sign up to your mailing list with discounts for purchasing your product or backing your project. Offering extra incentives is a great way to sign up more users while also encouraging further action. Sending users targetted messages is a great way to encourage signups. 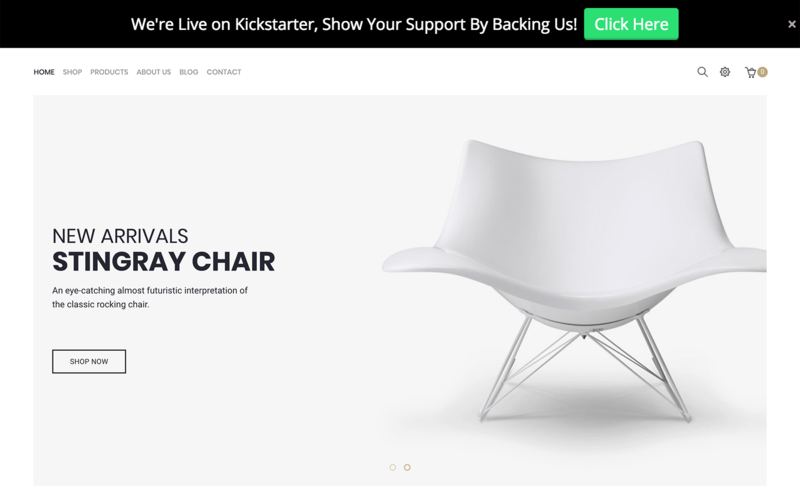 Using Gleam's Referring Domain rules you can present personalized messages to users who have found your website via your Kickstarter or Indiegogo page. 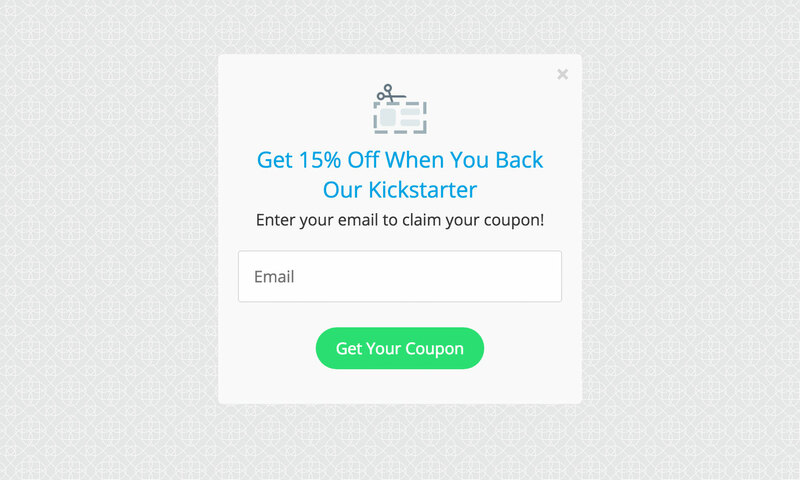 You can use this tactic to offer exclusive discounts to people who have already checked out your crowdfunding page. This will help you drive sales/backing from users who have already shown interest and grow your mailing list. If a visitor is leaving your website without engaging with your offers, consider using an attractive incentive to try and win them back. It's a good idea to offer a coupon code in these situations as if you want to win over users who are about to leave your site you'll probably need to incentivise them. Collecting email addresses and offering coupons aren't all you can use Capture for. If you have a crowdfunding page set up on Kickstarter or Indiegogo you can use Capture to direct website visitors to these pages in an effort to drive backing and raise your funding. Non-descript Captures like a Bar or Notification Capture can be great ways to subtly draw attention to these pages without completely distracting from your site. However, if you want to drive Kickstarter or Indiegogo traffic above all else then a more prominent Popup may be advisable. Check out our documentation on setting up your own Capture or get started right away! For a crowdfunding campaign, there may not be anything you can do to build brand trust and encourage backing that will be more powerful than collecting and sharing user-generated content. People like visual validation, and showing real people enjoying or having success with your product is the perfect way to prove that your project is the real deal and drive action. With Gleam's Galleries app you can easily build an elegant and responsive photo gallery which can import media from an array of online sources. The example below shows what a UGC Gallery could look like for Bears vs Babies, a popular card game funded on Kickstarter. So if you can encourage backers who have already received your product to upload photos with a branded hashtag of your choosing (or provide you images via Facebook) then you will be able to create a powerful photo gallery that essentially acts as a collection of highly engaging customer testimonials. Embedding your Gallery on your launch website is a great way to engage your visitors and encourage action, and if you also share the images you collect across social media you will be able to engage a wider online audience and attract a whole lot of attention. Most people who have backed and enjoyed your product will be more than happy to send some UGC your way, but if you want to really incentivise the creation of branded user content (and generate a lot of additional engagement) then you might want to run a photo contest where users can submit images of themselves enjoying your product for a chance to win a grand prize. Find out everything you need to know about running your own engaging photo contest and putting submissions on display. When you're running a crowdfunding campaign, there are a lot of different actions you want to drive. Email signups, social media interaction, and most importantly, financial backing. Well, Gleam's Rewards app can help you drive all these actions and more. With Gleam, you can build a Rewards campaign which will give discount coupons to users who sign up to your mailing list, engage with you on social media, check out your high-value promotional material or complete a wide range of other actions. A Rewards campaign which offers discounts to users is a great way to not only grow your online following and aid your promotional efforts, but also drive immediate backing or sales. By providing users with discount coupons you will make your offering more attractive, thus increasing user motivation to back your project. Remember, you can make users complete as many actions as you'd like before rewarding them. The key is to strike a balance between getting as much value as you can back for your coupon and keeping barriers to entry low enough to encourage maximum participation. Using Rewards' Redirect feature, you can easily redirect users to your crowdfunding page where they can use their coupon once they have completed the required actions. Check out our documentation on setting up your own Rewards campaign or get started with rewarding your customers now! Ready To Grow Your Crowdfunding Campaign?